Skincare products are 100% one of my favourite things to buy. Although I love browsing the MAC counter and swatching lipsticks all the way up my forearm in Boots, there’s something I find far more satisfying in buying skincare. My skin is very prone to spots and at some points I have experienced acne leaving SO MUCH SCARRING. 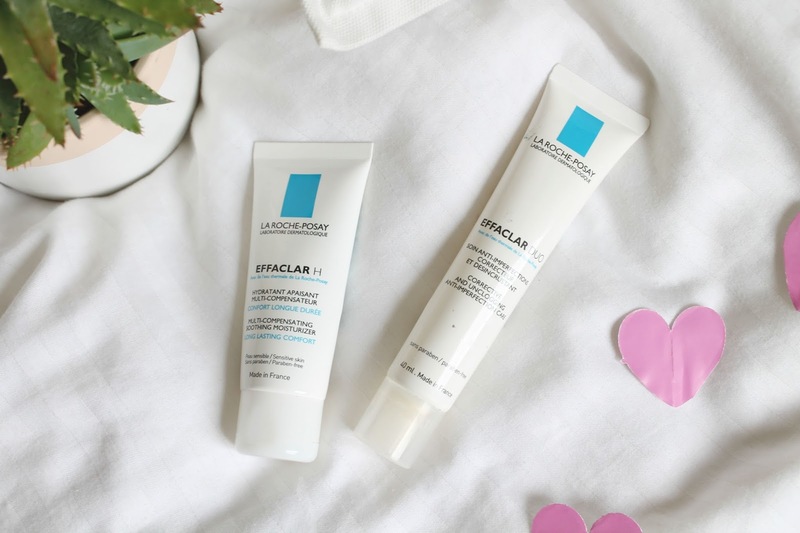 I’ve mentioned La Roche-Posay as a brand many many times in reference to the wonder product that is Effaclar Duo but having recently tried a moisturiser from them, a post featuring the two was inevitable. Effaclar Duo is THE best spot / anti blemish treatment I have tried. Ever. I've mentioned it so so many times but I feel like talking about it again is completely justified because it really is the dream product if you suffer with acne or particularly oily skin like myself (sigh). Effaclar Duo is the perfect product for reducing the size and redness of spots and really helps with the healing process too; I've counted on this product so many times around the time of important events and it has never let me down. The directions on the product mention that it can be used in the morning and/or evening but I've been more inclined to use it in the evening as an overnight treatment for my spots as I could never make it work as nicely if applied under make up but that might just be me! I would 100% recommend trying this product if you're struggling with spots or acne because it is completely non drying unlike a lot of other spot treatments I've tested and just really does work. It might sound like I'm over exaggerating to say I'd be lost without this in my skincare stash but I know how much the condition of your skin can affect confidence levels and now I just couldn't be without lil beauty. Having moaned a lot about my oily skin and constant need for powdering my make up every half an hour in the past I did experience extremely dry skin this year and let me tell you that was just as horrible. I never thought I would say this but I was actually v glad when my oily skin returned because I was finding it so so hard to apply my foundation to my dry and peeling skin (sorry for that gross image but this is a skincare post after all so I feel like honesty is really important). I had never really been interested in trialling a lot of moisturisers before and had just been using a random simple one that I had somehow acquired but when the dry skin was really really getting me down I looked into those that La Roche-Posay offered. I picked up the Effaclar H Multi Compensating Smoothing Moisturiser which is specifically targeted at oily skin and I think this is possibly my best purchase of 2015 (other than my macbook) (and maybe my AA playsuit) (it really is great though). I apply this morning and evening after cleansing and it has reduced the redness in my skin so amazingly!! Because the product is aimed at adding moisture back into oily skin that has been stripped or overly treated with drying products it worked so well at getting the perfect balance back in my skin. My skin no longer felt dry and painful (it had dried out so much because of some medication I was taking that my acne was painful, again sorry for that image) but this moisturiser truly was a life saver! The only slight issue I have with this product is that it does take a while to sink into my skin which is fine in the evenings but a little more tricky in the morning if I'm applying it before make up. I try to cleanse and moisturise my face as early on as possible to give the product enough time to sink properly in because otherwise it doesn't sit quite as nicely under my foundation but other than that I really cannot fault it. I couldn't be without either of these products now and using the combination of the two together in my skincare routine has improved the condition of my skin so much!! I really do understand how much the condition of your skin can impact your confidence levels but La Roche-Posay as a brand in general has helped tonnes with that. I will definitely be trying more from them. I hope this post was somewhat helpful to anyone who has problematic skin too, I really hope you give these products a go and they help you too!!! !